Usually when a message movie like Selma is released during the holiday season, the first thing I think of is "shameless Oscar grab." But Selma is definitely anything but a brazen attempt by a filmmaker to win an award. Selma truly is the most important movie you will see this year. While King is the leader and the face of the movement, the film wisely focuses on the movement rather than making King the central star of the film. King, his wife Coretta, and everyone else who was a part of the movement are integral to the film. The story does take some brief looks into the Kings' personal lives, with the alleged indiscretions of King being used against him by the FBI to destroy not only the movement but his family. But the story here is about the Civil Rights Movement and the people who were affected by the racial discrimination of the time, and how they joined together to affect change in the country. It wasn't easy but they made it happen and this is a very important lesson that people today need to see, in the same way that the LGBT community needs to take lessons from the movie Milk. Watching Selma, it's frightening how the story absolutely resonates today. There's that old saying that if we don't remember our history, we're doomed to repeat it and judging by the way the Supreme Court dismantled the very act this film depicts people of all races and religions fighting for – The Voting Rights Act – we are headed back to a time where white people seem to think it's okay to discriminate against black people. King was the face of the Civil Rights Movement, but where is our King today? Where is our Harvey Milk? There are plenty of organizations like the HRC putting out press releases condemning the kind of discrimination that is currently being implemented against blacks, gays and anyone else who isn't a white Christian, but where are the movements, the peaceful protests, the public faces to get on TV and speak for the masses? A person speaking directly to the public can get much more done than a press release. Until we see those faces leading the charge, we will continue to slip back in time. Director Ava DuVernay has done a magnificent job bringing this moment in history to life without being cloying or overly reverent. She lets us see the strife within King's camp, the rifts that began to form when he suddenly canceled the second march to Montgomery (thinking it was a trap when the police stepped aside to allow them to pass) after the disastrous end to the first march. If you aren't horrified and moved to tears by the violence inflicted upon the marchers as they peacefully walk across a bridge then you need help. David Oyelowo is perfect as King, showing us both the personal and public sides of the man, and delivering his speeches (or variations of the speeches as the filmmakers were not grated the rights to use the actual speeches) with the power that truly moved people to act. Carmen Ejogo is stunning as Coretta, a doppelganger of the real Coretta, and Tom Wilkinson pulls off a credible LBJ (even in the face of much criticism that his portrayal is inaccurate, a move some think is simply a way to discredit the entire movie). Everyone in the cast, from Common to Lorraine Toussaint, is excellent and though much has been made of Oprah Winfrey's role in the film as Annie Lee Cooper, a woman who is constantly being denied the right to even register to vote by any means necessary, she's only in a few brief scenes. The film closes out with the moving song "Glory" (which just won a Golden Globe) by Common and John Legend, and it is a very powerful accompaniment to the film. We should be seeing an Oscar coming its way as well. 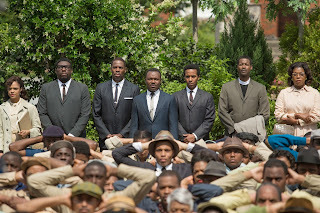 If you've been hemming and hawing about sitting through a true-life historical film, put those doubts aside and head to your local cinema to see Selma. You'll be moved, you'll be entertained, but most of all, you will learn something that you can actually apply to your life and the lives of others today.